← What is asset-based community development (ABCD)? 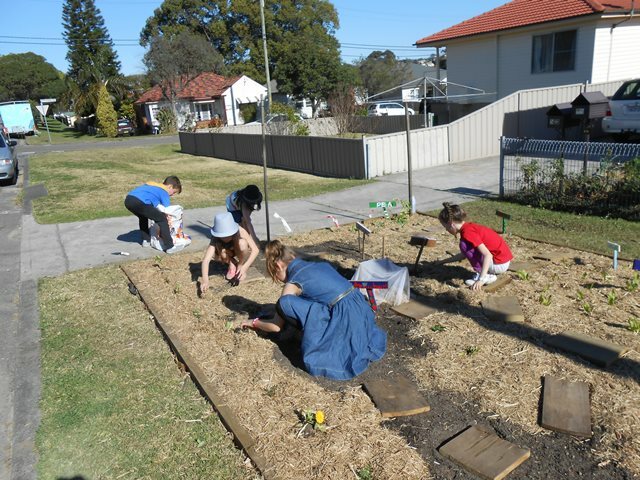 After two weeks, enthusiasm for the Kids’ Vegies on the Verge (the vegetable garden on our nature strip for kids in the street) is still high. Every afternoon somebody from the roster comes around to water it – although they are having to learn that it takes longer than a minute or two to water a 30 square metre garden! 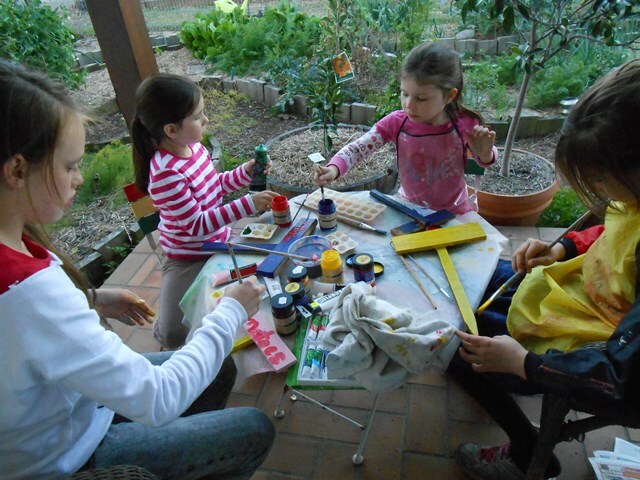 One day after school there was a spontaneous sign making workshop. We regularly have people around playing or chatting – after work yesterday we had six kids and six adults catching up on the nature strip. It is great watching horizontal community engagement happening before my eyes. It is really building relationships in the streets and is going to continue to do so for a long time. We now know the name of the woman who lives over the road – we’ve been on waving terms and have exchanged a word or two before, but didn’t really know her. She came over and asked us if we could use a table she was throwing out – its top is now being turned into a chalkboard for the garden. The kids are often coming around for a play and know each other much better – and it’s only been two weeks!. So far around 20 kids (not including friends or relatives who have dropped in) from five schools have been involved. We often chat with parents when they come up with their kids. We have all met people we didn’t know in the street. People have also been discovering connections: two of the fathers went to school together; three of us have worked at the Margaret Jurd Learning Centre (an alternative education program); one of our neighbours went to school with the daughter of one of our friends. 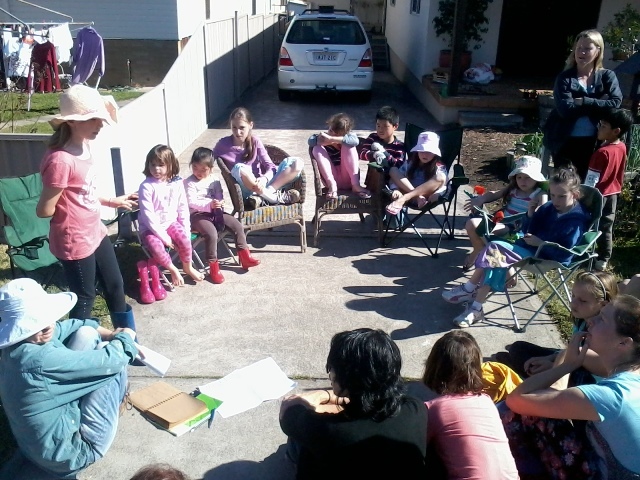 Last weekend there was a meeting (attended by 13 kids and five mums) in our driveway to do some planning with Cathy’s guidance. 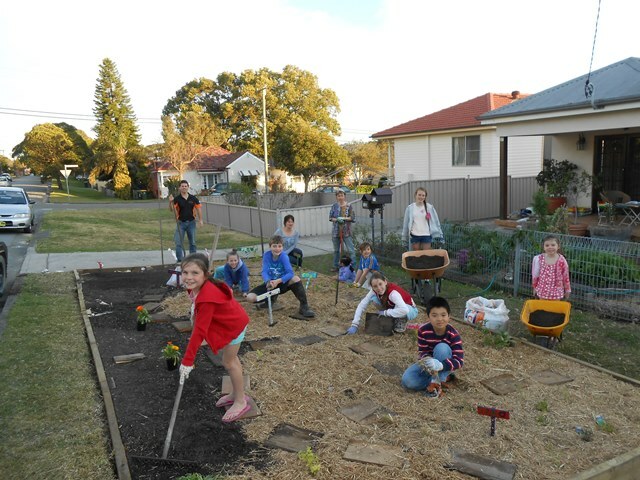 The kids have taken on various position: Convenor, Treasurer, Secretary, Street Communication Managers, Garden Signs Manager, Special Projects Manager, Special Events Managers, Stepping Stones Manger, Chalkboard Manager, Seed Planting Manger and Water Roster Manger. Most of them are taking their roles seriously (although they do need quite a bit of help – they are nearly all in primary school after all). They are planning a burger night early in September to celebrate the arrival of Spring and hopefully we will be able to use at least lettuce and herbs from the garden. Kids are around so often we have even started to reverse the car into the drive so that we can see more clearly when we leave. When we drive in we can clearly see if there are kids around, but when we drive out we don’t have as good visibility, particularly if we were having to reverse. We would hate to have an accident (or even a near miss) driving out in a hurry. We had a close shave. On the first Tuesday after establishing the garden, workmen descended out the front to work on the gutters opposite our place and next-door. We spoke to the workmen, who loved the garden (one wanted some peas), and they assured us they would look after our garden. 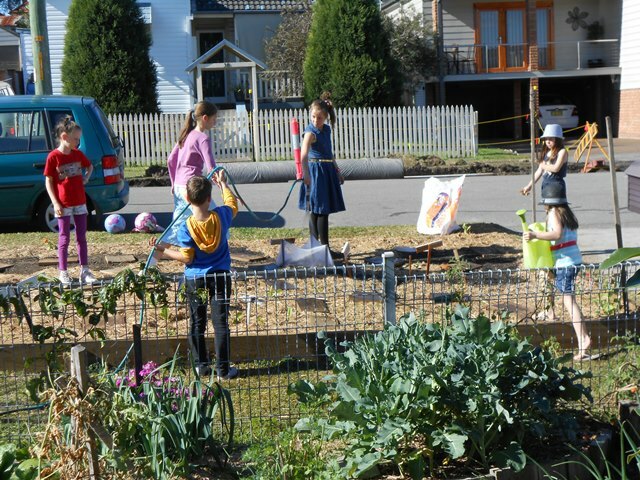 The kids’ garden would have been fine, but we were still relieved that they didn’t need to work on our place. The timing of it all was amusing. 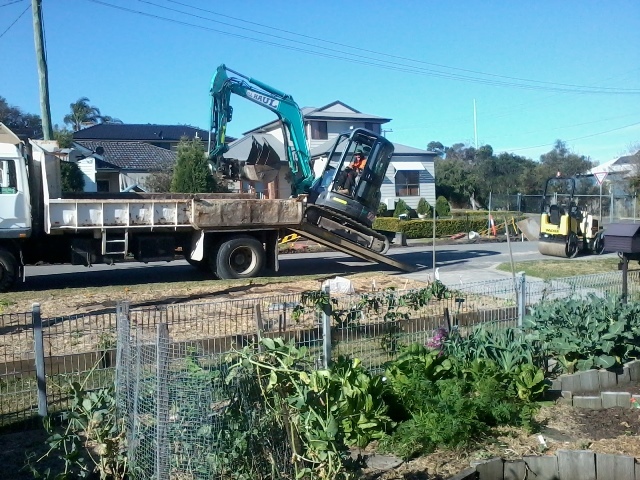 (One of neighbours joked that Cathy had brought in the bobcat to expand the garden!) Once again the garden helped build relationships. Cathy has been chatting to them quite a bit and even took them out some homemade vegie soup one day (with vegies from our garden, not the kids). The kids will be thrilled because an article by Tricia Hogbin (from the Little Echo Footprints blog), is in the Newcastle Herald (page 16 of H2) today: “Verge of Greatness“. 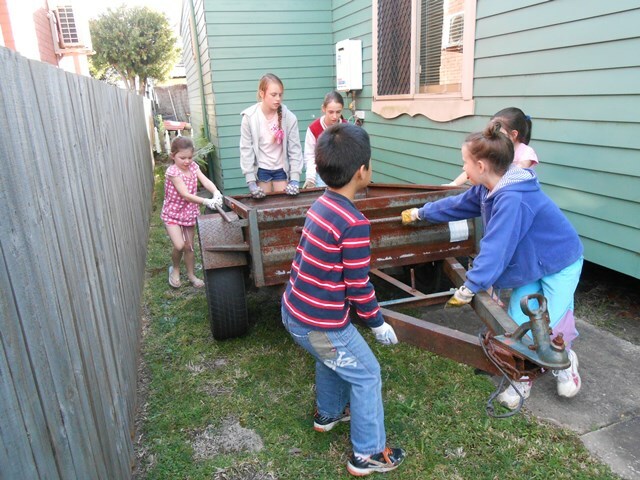 The Kids Vegies on the Verge is an excellent example of asset-based community-driven development. It didn’t start with a needs analysis, or focusing on the problems. It started with someone (Cathy) wanting to promote good relationships in the street and using her passion for gardening and transitioning to a more sustainable community. (A key inspiration was writing the food chapter for the Transition Streets Challenge.) It is community-driven, it hasn’t relied on external agencies or funding, and it is very much relationship driven. All communities have people who are good at building connections, who have a passion for something, who are willing to put time into their community, and/or who have good ideas. In some communities people are more likely to have the time, resources and confidence to do something, but in all communities informal networks are working and playing a role in building relationships. It helps that Cathy works at home and makes the time for the garden but it shows what can happen when people decide to do something in their local community. If external catalysts take the time to build relationships, to look at what is working, and to start with what people want and are interested in (rather than what some external person decides they “need”); all sorts of possibilities open up. What is Kids’ Vegies on the Verge? This entry was posted in Strengths-based approaches & ABCD, Working with communities and tagged ABCD, Examples, Kids Vegies on the Verge, Parenting, Working with communities. Bookmark the permalink.